I had left my Pelikan filled with R&K Dokumentus unattended in it's pen case in the bottom drawer. 7 months on, instant start. No skipping and delightful as usual. Pelikans are very good at preserving inks. My M800 was "okay" after a few months in the idle basket. Edited by torstar, 30 August 2018 - 14:57. In my experience too Pelikans can be neglected for a while with little effect on the ink inside, the first few words aren't even all that dark when used again after a while. That is still pretty impressive, as it's document ink (therefore pigment?)! Edited by Olya, 30 August 2018 - 16:41. My experience is similar with my modern Pelikans. My vintage 400 doesn't like sitting. Maybe when they changed from metal caps to plastic ones they got a better cap seal. None of my other FP's come close to the Pelikan time frame. OTOH, the Cross Townsend is holding up well too. This is one of the under appreciated pleasures of owning a Pelikan fountain pen for sure. My experience has been very similar. PELIKAN - Too many birds in the flock to count. My pen chest has proven to be a most fertile breeding ground. I have three Lamy FP's designated for ink testing duties using cartridges. I also tend to check ink staining capabilities of new inks prior to using them in piston fillers. Maybe when they changed from metal caps to plastic ones they got a better cap seal. Highly likely. When did they switch over? I think it was in 1982 when they introduced the m400. I think the 400NN that was produced until 1965 had a metal cap with an outer cover like the 400 and 400n did. Do all your vintage pens exhibit dry out issues or are there any robust examples? You should mention it on your blog. It is definitely an important factor to ascertain technical superiority compared to the competition. I was unaware of this aspect prior to this experiment which was mainly a combination of inquisitive and lazy. I just have the one vintage Pelikan, so I don't know if it's common to all of vintage models. I don't know if it's a technical superiority to other brands, the TWSBI Eco I have went months of not being used by my wife and wrote with first touch to paper. My other TWSBI's seem to go as long as my Pelikans, but I have not tested them like my wife did the Eco. Also the Platinum 3776 is said to go up to two years with the sip and seal cap. No drying out issues with my Montblanc 146's or 149. It's been mostly C/C pens I have had dry out. I had left my Pelikan filled with R&K Dokumentus unattended in it's pen case in the bottom drawer. 7 months on, instant start. HeHeHe...nice to know im not the only one that will occasionally forget about a pen and how long its been sitting. My experience with Pelican is the same as yours. They start first time, all the time. Because Im always working on pens, there can be as many as 20 pens inked up at a time. 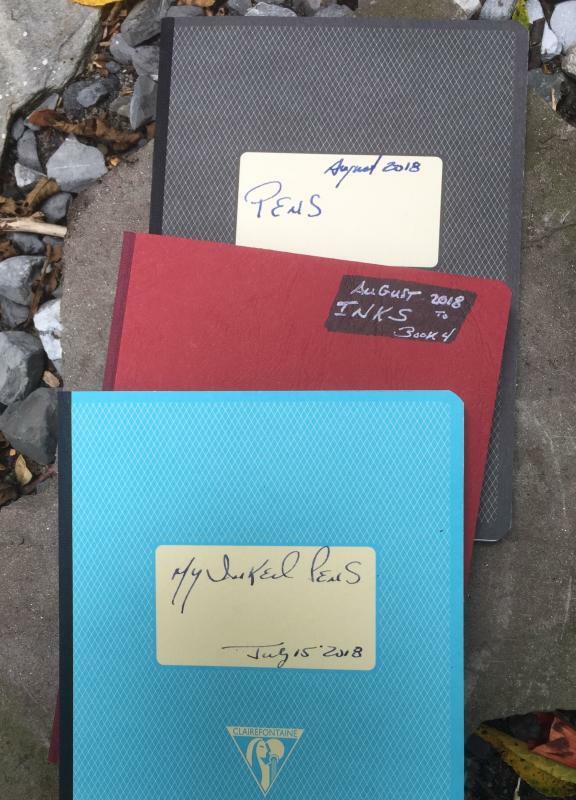 My memory seems to be getting worse with age so Ive evolved into a system of 3 log books. One for Inks. Sometimes an ink will look different depending on the pen and nib it comes out of. Another for Pens. Each pen I buy or work on gets a page. In it are described writing characteristics along with the details of any nib work, or other repairs are also recorded. The third book is only for currently inked up pens. With it I can tell at a glance what ink has been in the pen and when it was inked. I use Clairfontaine 1951Soft covered A-5 journals. You have a detailed record keeping habit. I am nowhere near that level. Nice touch with the Clairfontaine 1951 for the record journals. The TWSBI, Platinum and MB are all at different pricing levels and I would try these brands first in their respective segments. Platinum is great, my Plaisir was tested close to 10 months with instant start. IMO, dry out would be a parameter to consider although I agree it isn't top priority for most people. Nonetheless, I still consider the dry out time frame as a sign of technical superiority. E.g. none of the Lamy FP's (apart from 2K) can match the Pelikan in this regard even though both are German engineering/design. OTOH, Cross too beats Lamy hands down and both are C/C pens. I will test my other C/C pens although the Plaisir was fitted with a cartridge. Edited by 1nkulus, 01 September 2018 - 00:51. Lol..you’ve only seen the covers. Inside can get kind of sloppy. Because I work on other people’s pens, I found keeping a record of what went into the repairs made sense. After a while you lose track of which pen had which issue. They all kind of blurr together. The three book system is the best I could come up with. It’s not perfect. After a lot of years and a couple of full books, it’s tough to know which book and what page a given pen is located in. But most do get recorded. Maybe someone will come up with a better idea. I’m always interested in learning from others here at FPN. The good thing about the 1951 notebook is the bright white paper which allows inks to show their colors. It is not. The section and cap design of the 100, 100N, 140, 400/N/NN etc. should pretty much prevent any chance of evaporation. As in, the flat end of the section should mate with the flat end inside the cap (bottom part of the cap top) and thus form an air tight seal, keeping the nib and pen cut off from the rest of the world. If the cap has no cracks and the fit is right (and the seal tight) vintage Pelikans can stay wet for ages. My 400 cap does not have any cracks and seems air tight when I blow into it. I wonder why mine keeps drying out. Maybe I don't tighten the cap hard enough? All of my Modern Pelikans don't dry out. You would have to create a spreadsheet and add the journal number alongside the pen+ink combo. Depending on how long you have been recording, creating a spreadsheet could be a herculean task. You could also take pic/scan of each page and link it to the spreadsheet, although you might have issues with color reproduction.